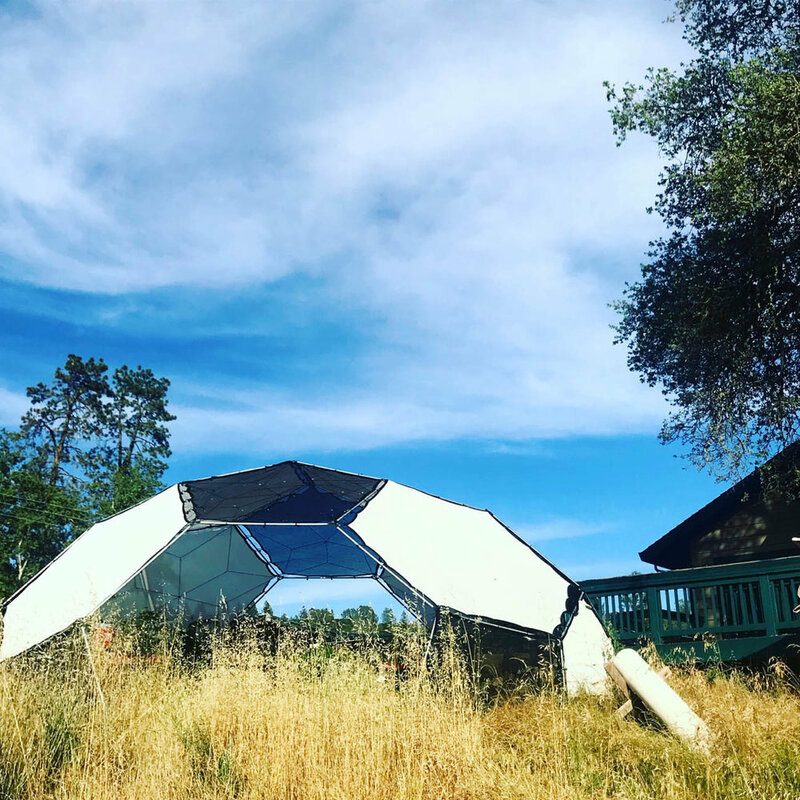 The other day we went out to Warewolf Ranch in Grass Valley, California to check on one of our permanent agricultural dome installations. Our very first soccer ball, we created it out of agricultural shade cloth instead of using spandex. 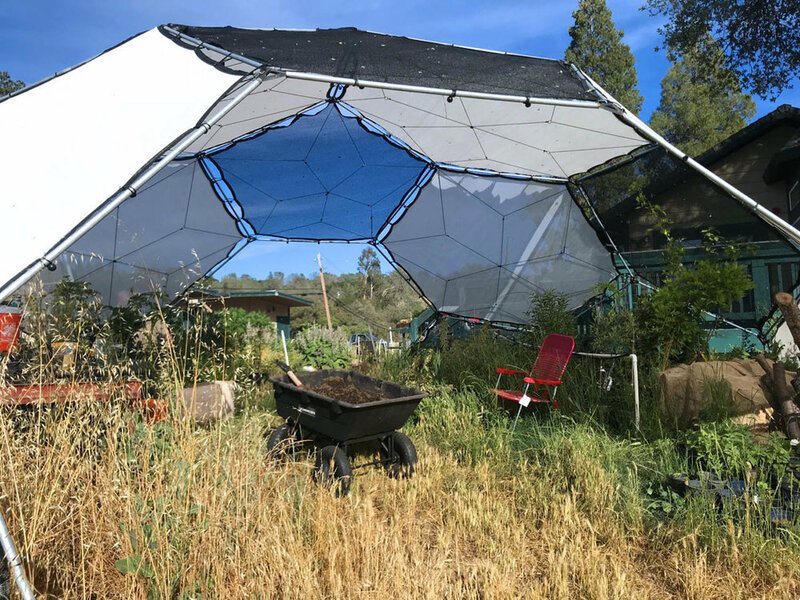 Made out of 80% shade white hexagons and 50% shade black hexagons, the dome is a perfect spot to grow plants that have to deal with the extreme environment around them. Warewolf decided to adopt the dome as a nursery for fragile baby plants and fruit trees. The woven shade cloth allows for breezes to pass through so it doesn’t get too hot. The woven cloth also cuts the strength of the wind significantly. For this farm, that was one of the big selling points. In the Sierra Nevada foothills, the winds can be quite strong. These young plants stand a better chance of thriving when the force of the wind is dialled back. The shade is also crucial for the survival of these new plants. By giving them protection from the scorching California sun they have a chance to get strong before they hit the hardest elements. The circular shape means that irrigation is also extremely simple. 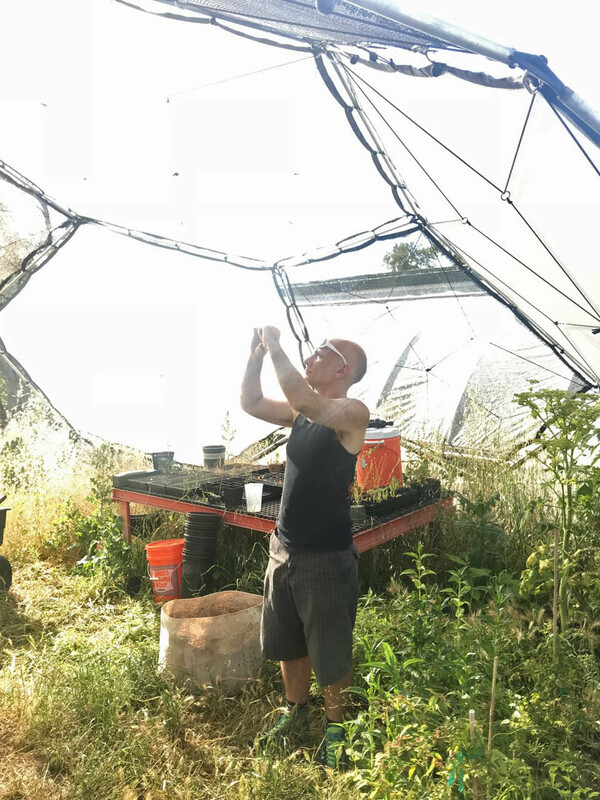 The irrigation easily serves all sides of the dome, which keeps the plants watered and healthy at all times. The dome has now been set up for an entire year and it’s still in great shape. The shade cloth is built for this type of work and it looks just as good as the day we installed it. The frame is in great shape too. The farm team installed rods into the ground and placed the side legs over them. That means no guying necessary, even in higher wind applications. Overall we were thrilled with our first season of farming. Tell us what you like about it! Would you use it on your farm?